Located in a quiet district only ten minutes from the city centre and the airport, the hotel Mercure Tours Nord offers spacious, air-conditioned rooms. 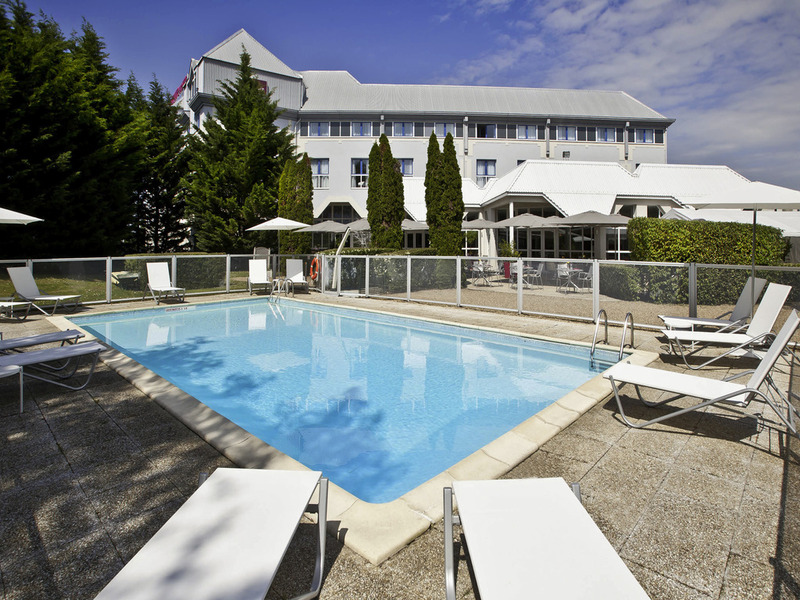 In he heart of the Loire valley, this modern hotel combines the practical with the enjoyable. Working seminars and family leisure breaks. But whether you're travelling on business or for pleasure, enjoy a moment of peacefulness. At the end of the day, enjoy a meal on the restaurant terrace, in green surroundings. During your business or leisure trip, take some time to discover the chateaux of the Loire. Enjoy this sublime architectural heritage, which so clearly justifies Tours' reputation as the cultural centre of western France. Take time to relax in our spacious rooms designed for business trips and family holidays. Discover the wines of the Loire Valley in our stylish bar. A warm welcome and professionalism are the trademarks of this unique setting. This was the second time for us on our way down to the Dordogne. Easy to find off the motorway. Clean comfortable room, friendly reception. The food in the restaurant is excellent, my fish and chips were superb. My only criticism is the service in the restaurant is very chaotic. We were left standing waiting to be seated for about five minutes seemingly unseen. We had to grab our own menus from another table, no glasses served with the water - only small things I know but a shame when the food is so good. We'll definately stay again. Accommodation was very good and comfortable. Receptionists were very good.No complaints. Was disappointed with the food and staff at the restaurant. Not at all good and the price for what we had was simply disgusting. Would not recommend it to anyone. Previous night at Ibis Pamplona was superb for much less money. I stayed in Tours for a business trip, good location on the north side of the city, not to far from Vouvray, if you like the wine. . convenient hotel for a business stay staff is friendly. I didn't use the restaurant or the breakfast in the morning. The room was very comfortable and large .Great shower.. good beds and all excellent for our 2nd stay here. The restaurant is good. I have one complaint. One of the servers in the bar and restaurant was full of flu. Running nose, coughing , sneezing all over and touching dishes and food. People should not work around food when they are sick. I do not want flu.. please keep people at home when sick and do not give it to us. otherwise we loved it. The salad freshure is the perfect kid of dish but last time it had lots of spirilsed vegetables. It was less good this time. Supplied all our requirements well except for the quality of the food served for Dinner. Very pleasant - from check-in, through dinner, a great night's sleep and breakfast. As one would expect helpful staff, good accommodation and ample parking. Dog friendly. We have stayed here before and we adore the rooms. Very stylish and spacious. Staff are friendly and very willing to help. Restaurant good but food is not cheap. Very nice stay, spacious and clean room. our first stay..... a delight. We loved the hotel. WE had Large and comfortable room.. remember to turn the heating all the way down to cool as it is hot at night. great beds and pillows and lots of space to spread out. Great shower. The amzing thing was the restaurant..This chef can cool We loved out food.. My Salad Frachieur was a the best . And the dish of of Ris de Veau and rongons was superb. You hardly every fine great classic cooing any more in France. It was divine. It is fabulous and we will come back. Not the best of the Mercure hotels that I have stayed at. The interior could do with a freshing up and does not reflect the expense of staying there. The bed wasn't up to the standard of some of the more inexpensive hotels in the group. We enjoyed our stay in the Mercure Hotel in North Tours. It was very convenient for our visit. and easy to find with good signposting. The Staff were eager to be helpful, the minor issues we had were resolved quickly.